Oosthuizen, who was at the peak of his powers in 2011-2013, when he held IBO super middleweight title (and later added the same one when he moved up north). He has been 1-2 recently, losing to Igor Michalkin in 2017, and exchanging W's with Thabiso Mchunu, as he ventured up to cruiserweight class. 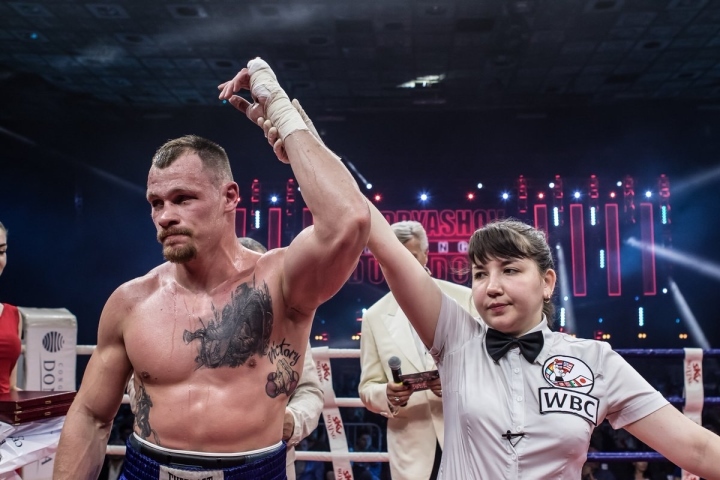 Egorov, meanwhile, was on a steady rise, getting three victories in both 2017 and 2018, which included former two-time world-title challenger LateefKayode. Egorov started aggressively (as always), while The Tommy Gun was mainly concentrating on defense. Utilizing rope-a-dope tactics, the South African was standing at the ropes, moving his upper body and sliding Egorov's hard shots. The Russian paid special attention to Oosthuizen's mid-section, troubling him with body shots from various angles, while headhunting proved to be less fruitful. In round two, his success rate got better and Thomas ate more leather. The first part of the fight was mostly is Egorov's favour, as he poured with power shots, only slightly decreasing his punch output and intensity. Oosthuizen tried to spear Egorov with an uppercut but wasn't exceptionally successful in doing so. More damage was done by Egorov, who has reddened South African's face. After the mid-point, the fight got hotter, as Oosthuizen tried to become more offensive and sat more on his punches. Egorov visibly struggled to maintain the same tempo but was biting very hard nevertheless. His actions brought success in rounds seven and eight, as the South African was cut over his forehead and had problems breathing, as his nose was busted. Egorov continued to deliver on sheer will, and Oosthuizen's punches were too week to be felt by the Russian. Both boxers delivered it during the last stanza. Final scores were: 100-90, 99-91, and 98-92 - for WBA #7 rated Egorov, who acquired a vacant IBF International title and improved his record to 8-0, 6 KOs. Oosthuizen is now 28-3-2, 16 KOs. It was a great learning experience for the Russian fighter, who at 27 is three years and 25 fights younger than the South African. WBA #8 super featherweight Akzhol Sulaymanbek Uulu (14-0, 7 KOs) delivered one of his best performances in tearing Pipat Chaiporn (also known as Mike Tawatchai) of Thailand apart and defending his WBA Asian 130lb title for the third time. Tawatchai / Chaiporn, now 33, usually competes as a a bantamweight or around that weight, and it showed in this fight. The Kyrgyz fighter used straightforward pressure and power to dominate the Thai veteran. Chaiporn absorbed continuous punishment but his wear&tear mounted as the bout progressed. The veteran's punches were hardly felt by Sulaymanbek uulu, while Chaiporn felt every ounce of Akzhol's gloves very well. In round six, punishment become damaging for Chaiporn. In the seventh round, Akzhol increased tempo and dropped the Thai fighter twice with hard straight body shots, effectively ending the fight after the second knockdown. Chaiporn drops down to 46-13-2, 29 KOs. In an extremely close and also bloody encounter, former Ukrainian amateur standout Eduard Skavinskiy (10-0, 6 KOs) survived a severe cut over his left eye, huge gashes and strong punches of potent Hungarian Laszlo Toth (27-5-1, 19 KOs) to come out with a split decision, not without slight controversy. Toth and Skavinskiy engaged in a shoot-out right away. Both landed huge leather, troubling each other, hurting heads more than body sections and delivering pure entertainment for local crowd. Both sustained cuts and gashes, bleed as hell but gave their all. Final scores were: 77-76, 77-75, and 75-77 - for the Russia-based Ukrainian. Team Toth and Toth himself were disappointed with a verdict, and the fight itself certainly warrants a second try for both valiant combatants. In a super featherweight eight-round non-title affair, Vladislav Krasnoshein retained his unbeaten record (7-0-1, 2 KOs) with a shutout unanimous decision over rugged Filipino Jon Jon Estrada (11-6-1, 10 KOs). The fight was closer than final scores (80-72 x3 across the boards) suggest. Estrada started aggressively immediately rocking Krsnoshein with some looping shots. He then delivered more heat in mid rounds, although the Russian was smooth enough to avoid danger in a majority of exchanges and used his style to frustrated the opponent. Super featherweight Mark "Canelo" Urvanov (15-2-1, 8 KOs) quickly dispatched South African veteran Pfariso Neluvhalani (12-14-2, 2 KOs), Neluvhulani was dropped once in the first round, and twice more in the second round, the last being a huge overhand left. Urvanov, 22, scored his second win since being held to a draw by Nikita Kuznetsov in September 2018. Recent Tajik expatriate Zafar Parpiev (7-1, 1 KO) endured some shaky moments but ultimately got the better of previously undefeated Thai import Aran Dipaen (2-1, 1 KO). Dipaen was dropped in the first but picked himself up and gave fits to Parpiev, fighting it to the end. It wasn't enough as Parpiev was awarded a unanimous decision over eight rounds at the end. In a slight upset, light heavyweight Denis Khamatov went in totally unprepared for huge punching power of big, muscular Gasan Gasanov, losing to him one-sidedly for the first time in his career. Gasanov dropped Khamatov down thrice in the first and finished the job with a big left hand with 40 seconds remaining in the second round. Gasanov, who works off the knife, improves his record to 16-7-1, 12 KOs.